I refuse to miss my children's high-pitched, pool-induced giggles because of my insecurities. You've got two choices every summer -- to put on a swimsuit or to skip it. I have a lot of friends who do the latter. They go to the pool with their kids, but they only put their feet in the pool. They sit on the sidelines, too concerned about what they look like and what others will think to embrace the joy of swimming with their kids. Or they go to the beach, but stay under the umbrella instead of running into the ocean. And it makes me incredibly sad. Because when women stay on the sidelines because of insecurity, we are modeling unhealthy behavior to our children and we are missing out. Your swimsuit does not define you. That soft tummy you are trying to hide? Has stretched and grown life. Those thighs that have long lost their gap? Gave you the strength to carry that beach ball for nine months, then walk with life hanging on your hips for years after. You are a mother. You are beautiful. Don't wear a veil of shame this summer. Put that swimming suit on. When we went to the beach in April, I weighed a few pounds more than I wanted to. But you know what? 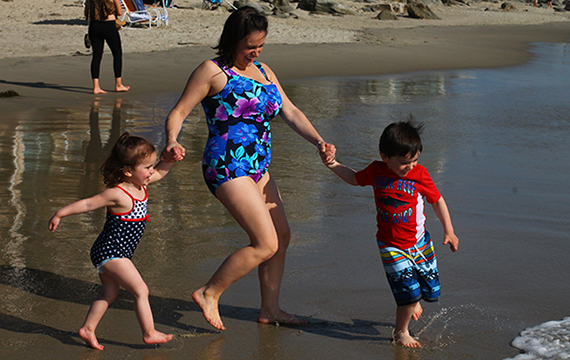 I put my swimsuit on anyway and RAN INTO THE OCEAN with my kids. We laughed and splashed and had the best time. Spending that time IN THE WATER with my children made such a difference. That night, I asked my son what his favorite part of being at the beach was, and you know what he said? "Running on the beach with you and Daddy." A few weeks after that beach trip, I found out I was pregnant. Every week this summer I am a little rounder than the week before. But you know what? 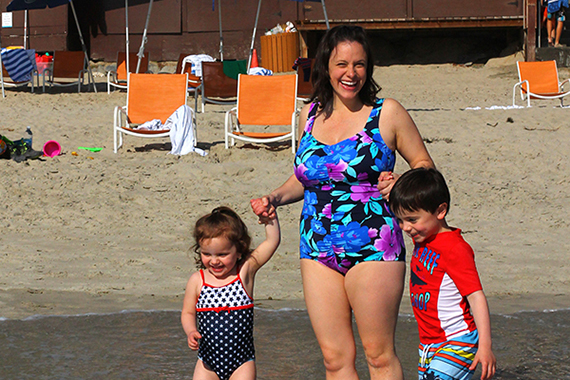 I still put on my swimming suit every chance I get and go swimming with my kids. They love swimming. And I love being with them. Last weekend, I put on my swimsuit, looked at myself in the mirror and took a deep breath. I'm already showing at just 11 weeks. But it looks more like too many potato chips than a baby. As I came out of the bathroom, Matthew said, "You look pretty in your suit, baby." I embraced his words, wanting to demonstrate beauty and confidence for my kids. I wanted to have fun and make memories at that pool. I refuse to let other women's judging eyes at the pool prevent me from exposing my kids' eyes to the wonder of the sun glittering on the water. I refuse to let my self-image influence my children's. Today, I hope to encourage you to push your insecurities aside. Put on that bathing suit. Run through the sprinkler. Jump in the pool. Splash. Your child will remember those moments and your freedom -- not how you looked in your swimming suit. This post originally appeared on The Mom Creative.